I was determined to get my kayak on the Rio Grande River. I had read that because of the limited number of put ins the shortest float available was about 10 miles. Given the slow pace of the river I imagined that would be a very long day. Luckily I ran in to an outfitter on the riverbank my first day. He was setting up lunch for his charges at a riverside picnic area and I asked him about the river conditions. 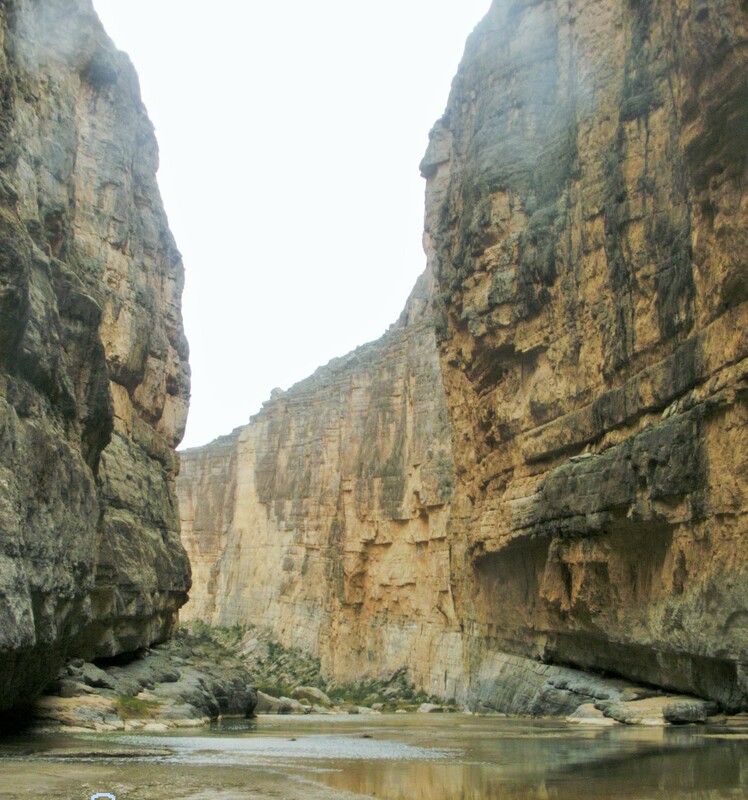 He said the prettiest place in the park was inside the Santa Elena Canyon and that the simplest way to see it was to put in at the end of it and paddle up as far as I could. So the very next day I loaded up the kayak and headed that way. The canyon is located at the very end of the Ross Maxwell Scenic Drive. At the outfitter’s suggestion I drove past the official boat launch about a mile before the end of the road and parked instead at the trail head. I then carried the kayak several hundred feet to the water’s edge. Paddling up the river was pretty easy. The river averaged only about 20 feet wide inside the canyon and although I knew the water level was down I was still very surprised to realize it was rarely over 2 feet deep. The water was gray and you couldn’t see into it at all. The biggest challenge was finding a channel deep enough to paddle through. It was often easier to get out and pull the kayak over a shallow area than fight the current in the narrow channel deep enough to float. I quickly got beyond where the hikers could see and the canyon was stunning. I made it one and a half miles upriver to this spot. 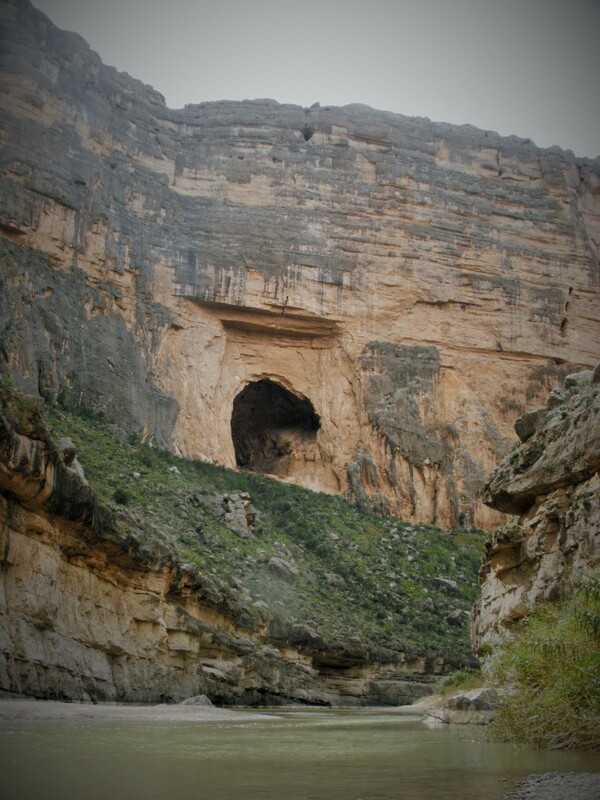 Unfortunately I could not explore this cave because it was on the Mexico side of the river and landing on their shore is against the law. A couple local canoers floated by and I asked them if the cave was natural or man made because it looked like it could be a mine. They said it was natural, the result of volcanic activity. They also said I should be able to make it another mile and a half up river before I would have to turn back. I decided I was satisfied with the days paddling. Instead I enjoyed the large American gravel bar across from the cave for a while then slowly floated back out. I would definitely like to do this float again on a warmer day, start earlier, and try to get 3 miles up it as they suggested. 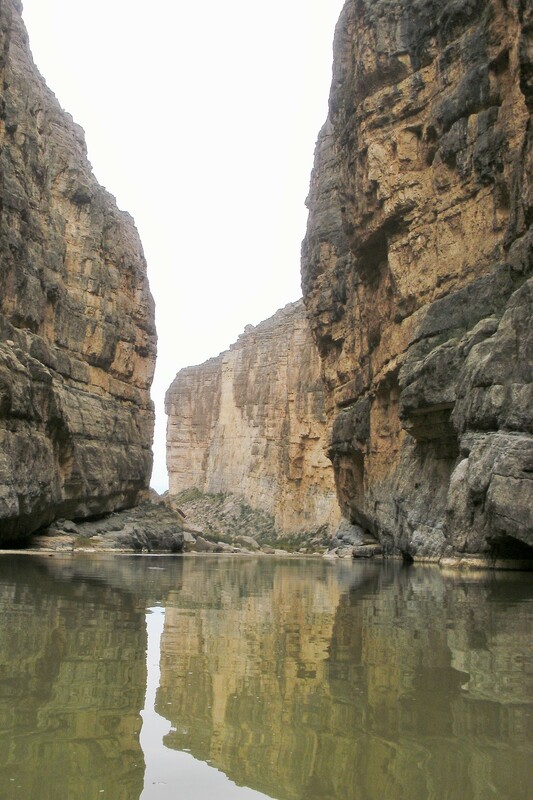 Maybe on my next visit to Big Bend. I backpacked with some cousins in the Big Bend Park back in 1970. It was a beautiful area. We left the day before a winter storm came in and dumped 2 ft of snow where we had been camping.